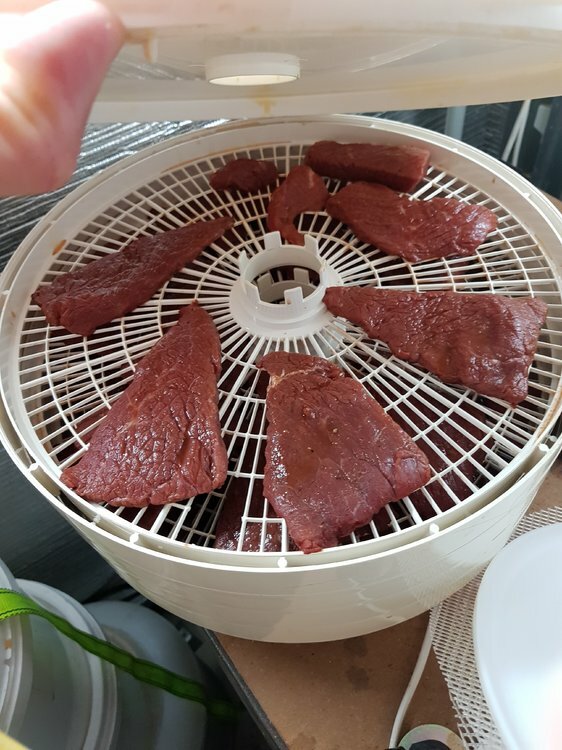 So was excited on to make some jerky and also to make some biltong.... so i have ballsed it up and made thick cut Biljerky. I am still fresh at jerking but I think if this works out I might do it more often. I love a good jerky. Puns intended in good humour if you are proud to offence, you probably shouldn't be on the coopers forum. So got some silverside (cause I'm tight) and sliced it up added a bunch of delish ingredients that work great on their own (hoping they are like the power rangers and unit to create a super power) Will let it sit for about 48 hrs and at 24hrs a sample will be tested. Enjoy happy Australia day lads... o bugger it beef not lamb. & marinate for at least 24 hours - I like mine revved up with Chilli & stuff, but there are lots of other things you can favour it with. Also the lady should keep drinking & to get used to the to the hot, spicy flavours. Not sure if you are doing it already but raw meat is easier to slice thinly if you freeze it slightly first. Marinated for over 24hrs. Its an experiment to see what I like. Steaks where cut about 5mm thick and instead of then cutting it into strips I left it as slabs. It always tastes good anyway, even without chilli.